Read the Wells Fargo Propel American Express Card Account Agreement. Redemption amounts and offers subject to change without notice. **Certain limitations, restrictions, and exclusions apply. 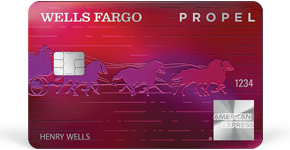 See the Wells Fargo Propel American Express® Card Guide to Benefits for details. To apply online, you’ll need a Social Security number and income information. You may not be eligible for introductory annual percentage rates, fees, and/or bonus rewards offers if you opened a Wells Fargo Credit Card within the last 15 months from the date of this application and you received introductory APR(s), fees, and/or bonus rewards offers – even if that account is closed and has a $0 balance. Cash redemption options by phone or online are redeemable in $25 increments only. Entertainment: American Express Presales offer valid in select cities. During the specified sales period, tickets are available exclusively to all American Express Cardholders (including Prepaid and International Cards). Tickets must be purchased with an American Express Card (including Prepaid and International Cards). Standard service charges apply. Offer is subject to availability. Not all seats are available and blackout dates apply. All sales final. No refunds. No exchanges. Offer may be changed or revoked at any time at the sole discretion of American Express. Some events may not be accessible to Cardholders with disabilities.